Green referred requests for additional information to Mariam Cebalo of Bonhams in San Francisco. In a telephone conversation Wednesday, Ms. Cebalo described the move as a “business decision” based on the profitability of the New York whisky auctions. However, she did not rule out a return to the market in the future. According to the Financial Times, the two owners of Bonhams have put the auction house up for sale, with a number of private equity firms having placed first-round bids with the investment bank hired to manage the sale. 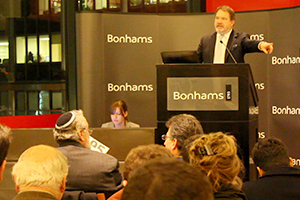 Cebalo denied any connection between the pending sale of Bonhams and the decision to wind down the New York whisky auctions. Bonhams is one of the two leading auction houses offering regular whisky auctions, along with McTear’s in Glasgow. However, Bonhams has been more aggressive in expanding its whisky auctions outside of Scotland with regular auctions in New York and Hong Kong, where Bonhams will hold its next whisky auction on August 15. The first Bonhams New York whisky auction was held in December of 2009 following a change in state law to allow auctions of distilled spirits along with wines, and since then Bonhams has held at least two whisky auctions each year at its New York gallery. This year’s spring auction was held on April 30, and the top overall bid was $59,500 for a bottle of Cognac dating back to 1762. A 40-year-old Royal Salute bottled in 1993 on the 40th anniversary of Queen Elizabeth’s coronation led the whiskies with a high bid of $10,115. The cancellation was first reported on the Los Angeles Whisky Society’s web site. Society members have been highly critical of Bonhams for several years over descriptions of specific whiskies in previous auctions. Editor’s note: This story was updated with reaction from Bonhams.